For the treatment of athlete's foot and dhobie itch (jock itch). For the effective relief of the itching and burning, cracking and scaling which accompanies these conditions. 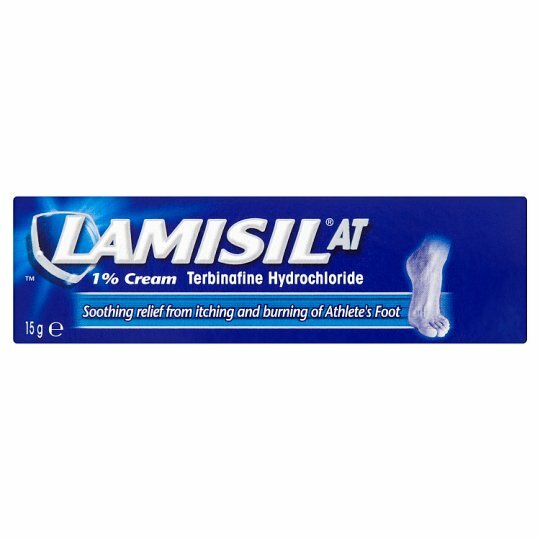 Lamisil AT 1% cream contains Terbinafine Hydrochloride. Always read the label. Directions: cleanse and dry the affected area thoroughly before application. Apply the cream to the affected skin and the surrounding area in a thin layer and rub in lightly. Athlete's foot: Apply once a day for one week. Dhobie itch: Apply once a day for one week. Not recommended for children under 16 years of age. Avoid contact with the eyes, mouth and face. If symptoms persist, consult your doctor or pharmacist. Read the enclosed leaflet carefully before use. Keep out of sight and reach of children.